Healthy natural clothes ethically made. Keep yourself up to date with news and discounts on natural clothing! Beautiful and practical products, made to last. Great service also. ..
To routine or not to routine? 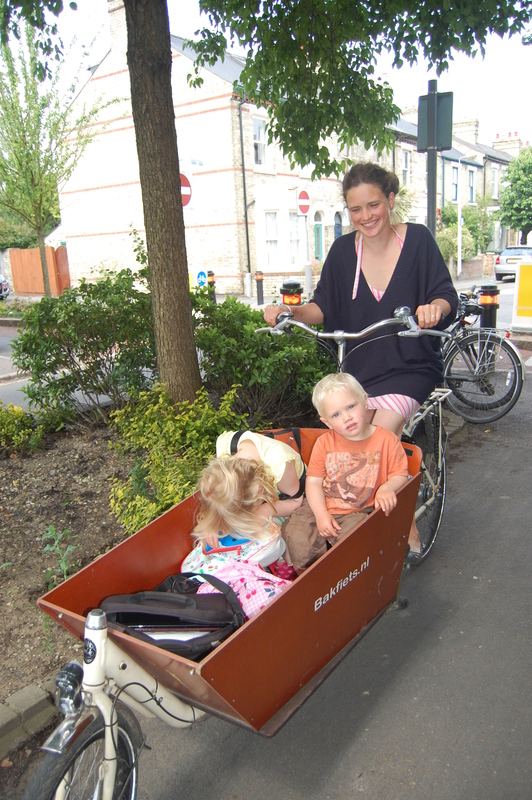 Home Cambridge Baby Blog Ten wonderful things about cycling! Ten wonderful things about cycling! I love working at Cambridge Baby for so many reasons, the biggest being the wonderful people here. But one reason struck me even before walking through the front door. I can cycle here. After years of commuting on stuffy buses I can merrily propel myself through the countryside over the commons, through the buttercups and past the cows to work. One of the wonderful things about Cambridge as a city is that so many people cycle to get around. All of us at Cambridge Baby cycle on a variety of both beautiful and battered bikes. On a Wednesday my husband brings the children from the woodland kindergarten on the box bike and I take them on from there. Yesterday we went and enjoyed the sunshine, splashing happily at the lido in the park. Freddie snuggled up in the box for a sleep, whilst Isla and I enjoyed lemonade ice lollies. Isla was fascinated that I could cycle and enjoy my ice lolly at the same time. So here are the Cambridge Baby team's ten wonderful things about cycling. So peaceful you can hear the birds sing and the cows snort (if its just you on the bike - can be noisier with the kids!). You can cycle somewhere beautiful for a picnic and don't have to carry heavy hampers. (I even got a ride in the box bike for our anniversary picnic.) Agnes's bicycle picnic food of choice are apples, as strawberries bruise to easily when she goes off road. Rosy loves the feeling of freedom at being able to propel herself and the wind in her hair. Children don't have to wait until their 17 to get that feeling of freedom. My 4 year old cycled 8 miles and was so proud she grinned the entire way. Rosy loves feeling part Cambridge (wherever you live) rather than been encased in your own metal bubble. Quicker than walking and even driving when the traffic is bad. Its brilliant exercise and your putting the calories to good use rather than wasting them on a treadmill. You can still fix your own bike. None of the stress of parking. 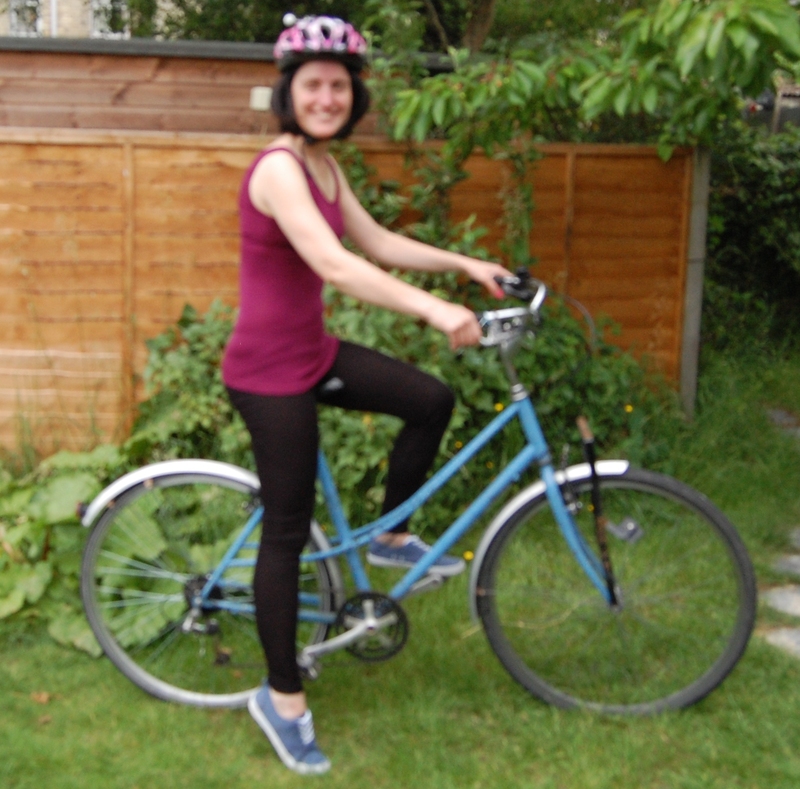 Here's Wendy on her bike in her Merino gear. This entry was posted on Thursday, June 20th, 2013 at 1:06 pm	and is filed under dressing for the outdoors, for the seasons. You can follow any responses to this entry through the RSS 2.0 feed. You can leave a response, or trackback from your own site. Copyright © 2019 Cambridge Baby.